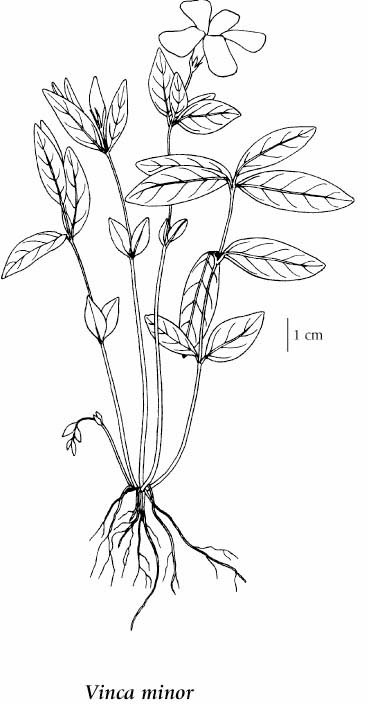 Trailing perennial herb, freely rooting; stems spreading, 10-60 cm long, branching. Opposite, egg-shaped to egg-shaped-lanceolate, narrowed at the base, 3-9 cm long. Solitary, bluish-purple, usually 20-30 mm wide, 1 per stem, calyx lobes glabrous. Long cylindric pods without tufted hairs, 3-5 cm long. Roadsides and waste places in the lowland zone; infrequent in SW BC, known from SE Vancouver Island, the Gulf Islands and lower mainland; introduced from Eurasia. This species is listed are one of the twelve most problematics species in the Vancouver Region by the Greater Vancouver Invasive Plant Council. For further information, visit their web site.